Exploring the Connections Between Non-Standard Work and Productivity: A Policy Agenda? Productivity is the policy issue of the moment. The Productivity Insights Network (PIN) aims to unpack the sources of the UK productivity puzzle, to better understand why output per worker hour has flat-lined since the 2008 economic crisis and propose policy remedies. Although productivity has failed to grow, employment, hours worked, and output have increased broadly in line since 2012. A significant proportion of the new jobs created have taken the form of non-standard and sometimes informal work (e.g. zero hours contracts, temporary work, `bogus’ self-employment). PIN is hosting a one-day workshop to explore the connections between the growth of non-standard work and productivity. The labour market conditions that may be inhibiting the return to a higher productivity trajectory. The relationship between the growth of non-standard contracts – zero hours, temporary and `bogus’ self-employment – and workplace practices that may be inimical to productivity gains. The significance of fissured workplaces and non-compliant business models. The sources and dimensions of workplace inequalities. The elements of a new policy agenda. 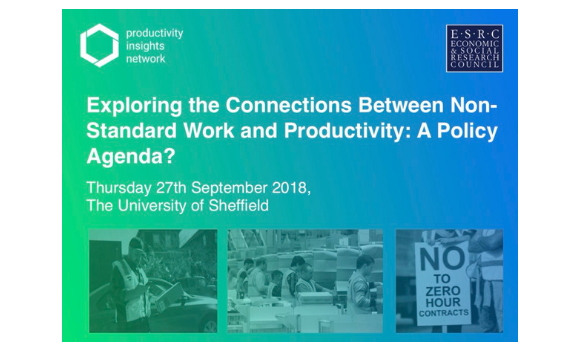 The event took place on Thursday 27th September at the University of Sheffield with attendance from policy makers, researchers, employers, and trade unions. For queries, please contact: productivity@sheffield.ac.uk.